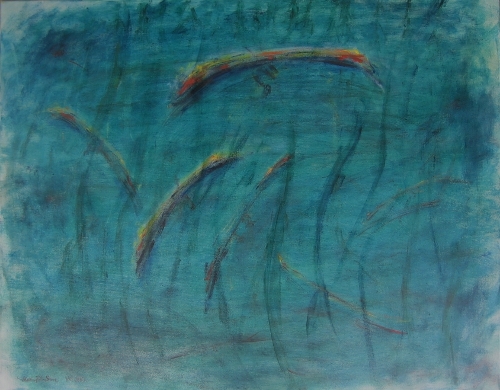 My 2010 oil painting, “Leisurely“, featured a calm body of water in dreamy aqua tint, over which swayed some soft bands, reminiscent of weeds or kelp, intersecting with shorter objects – an array of rowing boats. At the first glance, all looked orderly – Alles in Ordnung. Yet, upon closer inspection, viewers will discover that the seemingly tidy boats in formation, actually were upside-down and they were sinking to the bottom, however serenely, especially the rower inside the completely capsized ship on the top of the painting. So much for the idyllic scene – an allegory of our uncertain and oblivious time. This painting was published by Wilde Magazine in Issue 2, 2013. It has been choose to be part of the curated exhibited at Expressions Gallery in Berkeley (25 July – 16 October 2015: Water, Water! Water?.